Trail running has seen quite the increase in popularity over the last decade or so, with participation more than doubling (4.2 million to 9.1 million) between 2007 and 2017, according to the 2018 Outdoor Participation Report released by the Outdoor Industry Association. And it’s easy to see the draw. The scenery on trails tends to be picturesque—or, at the very least, it offers something other than mile after mile of pavement to pound. The trail running community has also earned a reputation for being fairly inclusive. If you show up and are willing to put in the miles, you’re in, regardless of your most recent 5K time. For those who are interested in longer races or who are entirely new to the running game, the focus trail running tends to put on simply completing a route rather than zeroing in on a pace can make the idea of running a longer distance less intimidating. However, there are some significant differences between running roads and running on trails. Naturally, that means there are also specific ways that an aspiring trail runner might want to train before a race, even if they’ve got plenty of road miles on their legs. We reached out to Mike Smith, director of cross country and track and field at Northern Arizona University in Flagstaff, to see what he had to say about some of the biggest differences between road and trail, as well as how he’d recommend stepping into the sport. Smith advises approaching trail running with a willingness to abandon the numbers you might feel tied to in road running and, instead, simply start out with curiosity to see what various efforts will yield. When you run that same route again, you can compare your results—this will give you more of an apples-to-apples comparison than relying on your road-running data ever could. “We’re taught initially that, in running, our competition is the clock. It’s about trying to run faster than we ran before,” Smith says. But when it comes to running trails, even if you are on the clock, your primary competition is a mix of the terrain and the limits of your body, especially as you graduate to longer distances and more challenging routes. Simply getting from point A to point B is no longer a guarantee. “It becomes, ‘Can I complete this distance? Can I get over these mountain passes? Can I fuel myself for that, and can my body actually hold up?’” he says. 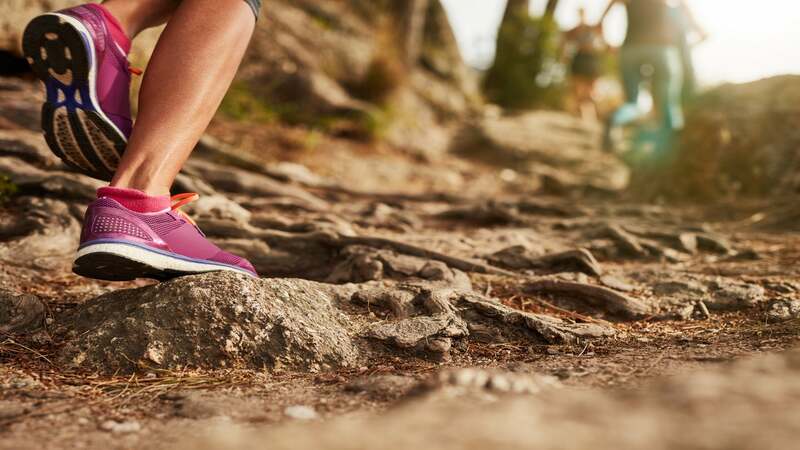 The same can’t be true for trail running, where runners have to pay close and constant attention to what their feet are doing, always monitoring for any changes in terrain. “Your reaction time is critical,” Smith says, “so some good basic training is to remember that if you’re going to look around and take in the scenery, stop and step off the trail, maybe snap your picture. But when you’re on the trail, keep your eyes down.” Gazing about 20 degrees in front of you will help you anticipate what’s coming on the path ahead. Smith also sees many novices struggle with appropriate energy expenditure. 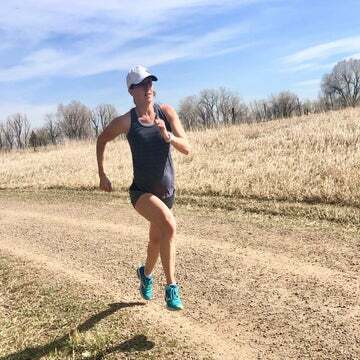 As previously noted, new runners often start out trying to maintain a pace on a hilly single track they’re accustomed to holding on the road, which can leave them without enough energy to finish the trip. But there’s also a learning curve involved in figuring out how to read the terrain and how to plan ahead for both the physical and emotional energy expenditure that each trail segment will require. “Sometimes in trail running, you’re going to need to spend your emotional energy unevenly,” Smith says. For example, you might find yourself needing to dig deep on a long, uphill climb, but you can do that better if you trust that your energy will replenish and you’ll feel good again on another part of the course. “You’re going to have good patches and bad patches, and learning not to trust the bad patches, knowing that they’re not going to last forever, is a skill that’s honed on the trail,” he says. Having gravity on your side doesn’t necessarily mean you’ve got it easy. Downhill running also requires a certain amount of skill. “It’s challenging because it can make you really sore. Your body absorbs force to a greater degree coming down, so your quads seem to load up, and people can get sore hamstrings from reaching out. It can also be kind of sketchy because you’ve got rocks and roots that you’re navigating at a higher speed,” Smith says. Try to avoid the natural inclination to hold back and break the momentum—it doesn’t just slow you down, it’s also hard on your body. Smith’s advice? “Learn to lean forward and put your center of mass over your hips,” Smith says. “Downhill running feels like you’re going to fall on your face. You have to lean forward and sort of freewheel, and just trust that your brain is going to navigate what’s happening around you, because you want to use all the momentum of gravity.” To see if you’re in the right position, note where your chin is when you look down (it should be in front of your knees). When it comes to hitting the trails and being prepared, start by taking the climate and terrain into consideration. In a hot and arid environment, or at high altitude, even a water bottle might not be enough, so it may be wise to try a hydration pack—even if you’re just going out for a shorter jaunt. And remember, you’re at greater risk for getting lost or injured than you would be on the road, so having your phone and a light jacket on hand could really be beneficial if you find yourself having to slowly hike out or need to wait for help to arrive. The best way to train your body (and your mind) to tackle more miles on the trail is to do more trail running. However, not every runner with the dream of running a hilly 25K in the woods has the ability to get out on trails regularly. Fortunately, Smith knows of a few ways urban dwellers and flatlanders can prepare for a solid trail run. Trail running is going to test the aerobic engine, so make sure you’re building duration on your regular runs, even if they’re flat and paved. Go long! Incorporate barefoot balancing exercises and make your whole foot interact with the ground. The foot, the toes, the arch—every part of your foot is constantly working when you’re running trails, so anything you can do to strengthen the foot will help. Lose the shoe and stand on one leg, do barefoot lunges, you name it—force that foot to work. If you have a hill or a bridge, try adding in workouts where you go hard for two minutes, easy for one, repeating over and over as you run up and down to get your body used to holding different efforts in different circumstances. Do a flat run outside, then add in some treadmill hills by putting the incline up to 10 or 15 percent, and run that 12 times (30 seconds each time) with a one-minute rest in between. You can also set the treadmill to a moderate grade, like 6 or 8 percent, and work on a steady buildup to a 20-minute climb. Start with just 10 minutes, then next time do 12 minutes, then 14, over the course of a couple of weeks until you’re climbing for the full 20 minutes. These additions don’t have to happen every day, but throwing them in during the week here and there will help you prepare for higher mileage on rugged terrain, even if your regular route is smooth, straight and offers an elevation of zip. 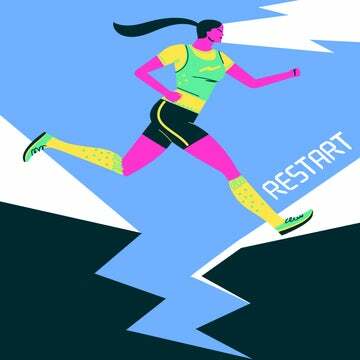 With some smart training—and the right attitude going in—your next trail run can be a great one, even if it’s your first one.